Edited by José Milei and Giuseppe Ambrosio . More than 50 years ago, in 1957, Bridgen the word “cardiomyopathy” has been used for the first time. One year later, Teare described nine cases of interventricular septal hypertrophy. In this book the broad aspects of cardiomyopathies are fully developed by renowned specialists. The book is divided in five sections – Cardiomyopathies - general aspects; pathophysiology and molecular mechanisms; genetics; sudden death and cardiomyopathies in special populations. The disease of the heart muscle may develop secondarily to other cardiac alterations, such as ischemic, hypertensive, valvular and systemic, among others. However, there is also a group of conditions with intrinsic myocardial involvement of genetic or multifactorial etiology, characterized by high morbidity and mortality that represent a diagnostic and therapeutic challenge for the physician. Cardiomyopathy (primary) is defined as a disease of the myocardium, which results in insufficient pumping of the heart. It is classified into four forms; dilated cardiomyopathy, hypertrophic cardiomyopathy, restrictive cardiomyopathy, and arrhythmogenic right ventricular cardiomyopathy. The book is focused on these forms, its features, its pathophysiology, and its relationship to sudden death. Mention is made also on general aspects, like ecocardiographic findings and myocardial contractile reserve, specific as pathophysiology and molecular mechanisms. Special attention is deserved to cardiomyopathies in special populations, like pediatrics, diabetic patients, and women, as well as to cases of chronic heart failure and dilated cardiomyopathy. Cardiomyopathies are characterized by extensive remodeling of the myocardium manifested as hypertrophy, due to enlarged myocyte size and interstitial fibrosis. With the progression of the disease, the heart turns to a dilated state, with increase of the intraventricular volume and a mild increase in ventricular wall thickness. These changes, apparently compensatory, ultimately become maladaptive. 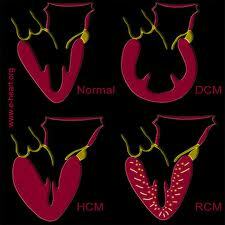 Dilated cardiomyopathy is one of the most common types of cardiomyopathy worldwide. It is characterized by progressive chamber dilatation and myocardial systolic dysfunction and diagnosed by left ventricular enlargement and impaired systolic left ventricular function. Regarding diagnosis, echocardiography is the most frequently used and readily available cardiac imaging technique. It has been established as the cardiac imaging modality of choice in diagnosis and longitudinal follow up of patients with cardiomyopathy. In most patients suffering from cardiomyopathy and heart failure, symptoms are not present at rest but become evident with exercise. As said, the test universally used is echocardiography, but it is generally performed under resting conditions and left ventricular contractile function at rest is not reliable for the evaluation of the reversibility of myocardial contraction, that is contractile reserve. For this reason, it is important to evaluate functional response also under dynamic conditions by the use of pharmacological and/or exercise stress. Also, the prognostic value of dobutamine- and pacing- induced mechanical alterations in outpatients with idiopathic dilated cardiomyopathy and severe heart failure is discussed, with respect to clinical conditions and mechanisms of development. In this connection, left ventricular twist is indispensable for proper left ventricular function. It originates from the dynamic interaction between oppositely wound subepicardial and subendocardial myocardial fibers. The direction of left ventricular twist is governed by the subepicardial fibers, mainly owing to their longer arm of movement. Measurement of left ventricular rotation by echocardiography has only recently become clinically feasible with the development of speckle tracking echocardiography. It has become clear that increased left ventricular twist, for example in hypertrophic cardiomyopathy, diabetes, and in healthy ageing population, may serve as a compensatory mechanism to preserve ejection fraction. Also, it is emphasized that measurement of left ventricular untwisting may become an important element of diastolic function evaluation in cardiomyopathies. Since 20 years, several mutations in genes encoding sarcomeric proteins have been causally linked to cardiomyopathies. There is a long list of affected sarcomeric proteins of striated muscles. Some selected proteins are described as to the molecular structure of their genes, as well as a comprehensive and up-to-date listing of the mutations that have been identified and directly linked to the development of cardiomyopathies is provided. Most cardiomyopathies with primary myocardial pathology predispose to sudden cardiac death, especially in younger subjects. Although they account for a small fraction of population, a subset of these patients are at high risk and this justifies an aggressive preventive strategy. These include dilated cardiomyopathy, hypertrophic cardiomyopathy, left ventricular non-compaction and arrhythmogenic right ventricular cardiomyopathy. Sarcoidosis is a rare form of cardiomyopathy that affects young patients and put them at risk of sudden cardiac death. Early recognition and treatment of all these disease is mandatory. Regarding diagnosis, 123I-MIBG scintigraphy to evaluate myocardial sympathetic nerve activity may be useful in risk stratification of the risk of sudden death in heart failure patients without sustained VT and a history of ventricular fibrillation and dilated cardiomyopathy. Implantable defibrillator therapy has emerged as the most important management strategy for prevention of sudden death in patients with cardiomyopathy. Whilst the use of beta-blocker therapy, angiotensin-converting enzyme inhibitors, angiotensin receptor blockers, as well as aldosterone antagonists have been shown to decrease the risk of sudden cardiac death especially in in patients with congestive heart failure. Heart failure in women has a distinct phenotype; develops later in life, generally presents with preserved systolic function and it is less attributable to ischemic heart disease. In many women, an important event in heart failure is due to poor venous return resulting from inadequate calf muscle pump activity during upright posture. This explains that while women survival rate with heart failure is better, their quality of life with heart failure is far worse. As shown, the broad spectrum of new aspects of "Cardiomyopathies" are developed in this book, with the hope to be useful to cardiologists.